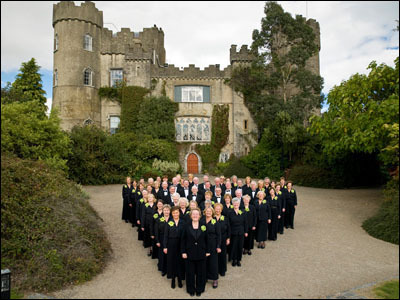 Enchiriadis Treis is a mixed adult choir of about 120 voices, based in Malahide, County Dublin, Ireland. Founded by Dr. Marion Doherty Hayden in 1994, it is committed to achieving musical excellence through performance of the great classical choral works. We are united by our love of choral music and by a desire to perform it at the highest possible level. Our main repertoire is based on the great classical choral works, but we also perform works by modern (including Irish) composers. Our repertoire also includes sacred music which we perform for smaller, local performances and on our trips abroad. Our motto is “Excellence Through Performance”. We aim to improve with every successive performance and we see ourselves as being on an unending musical journey of continuous learning and improvement. We have been led since 2011 by our wonderful musical director Cathal Clinch along with our superb accompanist Jillian Saunders. 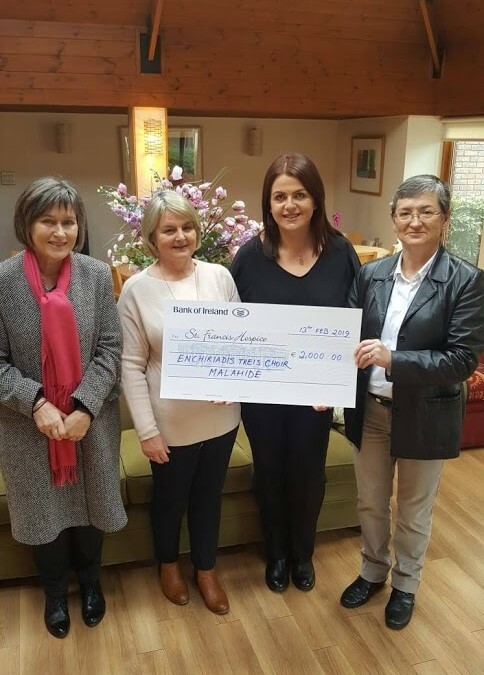 Presentation of cheque for €2,000 to St.Francis Hospice, proceeds of our 2018 Christmas Carols.